USGA "Fore The Golfer" Videos. All You Need To Know! 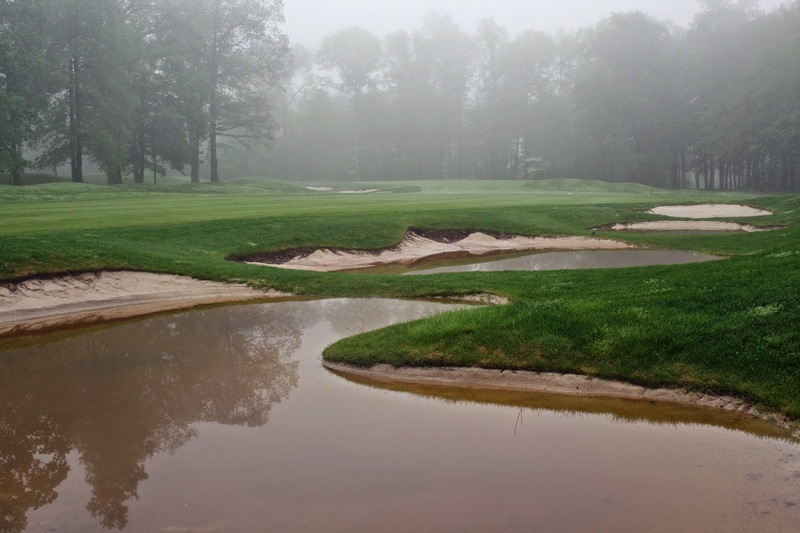 Here are some excellent videos published by the USGA Green Section. Take the time to watch these short, but informative, videos. Always take the opportunity to see what is going on agronomically with golf courses in the Northeast by visiting the USGA Northeast Report. Get Ready For Tough Rough! I can't believe I'm still getting soil temperature readings in the fifties and it is May 24th! Don't let this fool you. The turf is finally breaking dormancy. We mow the rough around the greens at a two inch height and the primary rough at two and one-half inches. Don't be fooled... The turf is growing quickly, so what is two inches today might be 25% higher in two days! Our goal is to mow all rough areas at least once per week. Primary rough and heavy play areas will get mowed twice per week. We also try to "ring" the fairways and greens with a third cut on a weekly basis. Approximately twenty-five feet wide. This cut ensures that a player has a decent lie if they just miss the mark in primary play areas. Summer is going to come quick. We have already seen signs of wilt (by design) on the course despite the unusually wet Spring weather and high water table. You may see some greens that look stressed because they are. My ability to stress specific turf varieties, especially Poa Annua, during a "non-stressful" spring weather period, is an opportunity to further improve our chance of surviving summer stress. I know it sounds crazy! We keep turf as dry as possible while soil temperatures remain cool. The goal is to have turf roots "dig-deep" for water. The enhanced root depth we develop now helps our turf to survive the anticipated summer stress. City water project progressing quickly! 10,000 square feet of sod being laid on hole #10 on Wednesday May 28th, in primary areas, to quickly improve playability and reduce "washouts" from potential heavy rain. Any Questions??? Let me know! 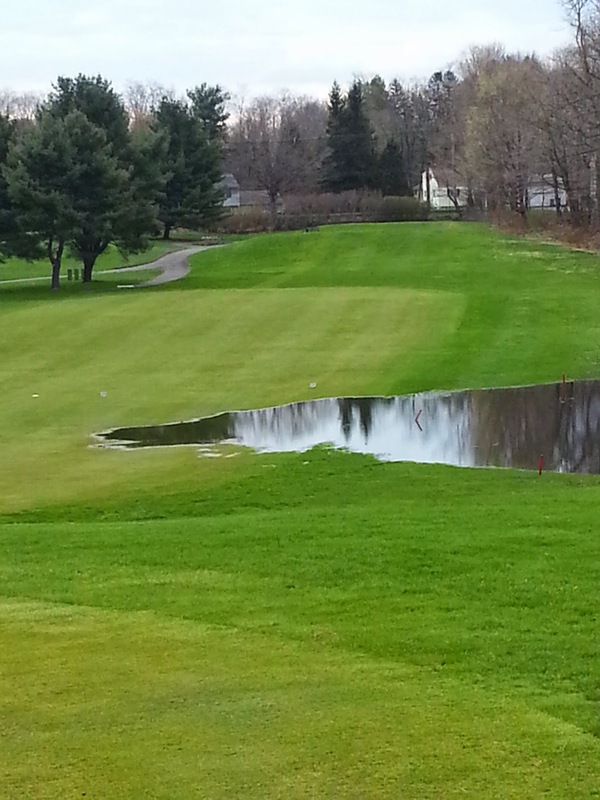 Two and one-half inches of rain last night has saturated the course yet again! We are back to pumping bunkers and clearing drains. Cinco de Mayo! 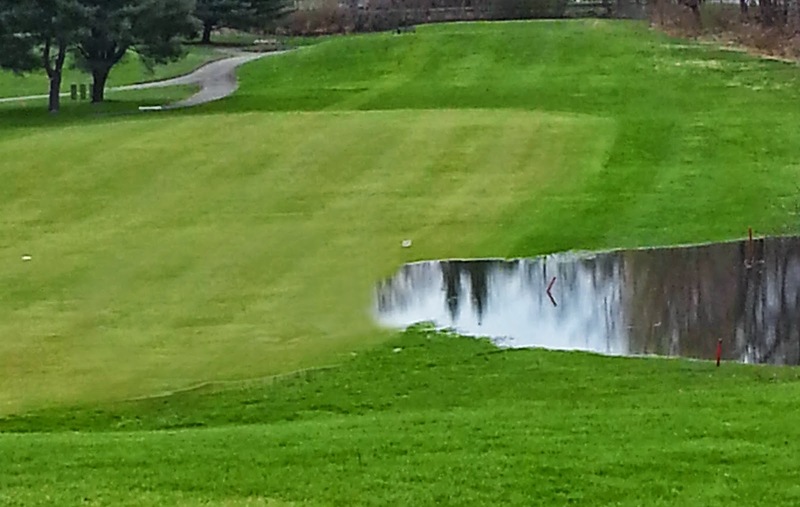 Course Status! We are finally staring at three days of sunshine! What will happen? The turf is going to finally start growing!!! We have begun our Spring herbicide applications. I would have started a little earlier, but it has been so wet that the damage from equipment would have been intolerable. Not to worry... We are still right on time! Greens are slowly improving after aerification and they look very healthy. Warm days will speed the process. We will start to slowly lower the height of cut tomorrow. This is our standard procedure early in the season. The creeping bentgrass and Poa Annua are not growing much yet and we are mostly mowing sand. Obviously, sand does not help our mowers. The blades dull quickly and must be changed often. Divot mix is now being put on the course and at the pro-shop. Remember the rule! Use divot mix on tees and fairways only. If divot mix is not available, replace your divot. Always replace your divots in the first cut and rough. Buckle Up! We have a golf season on our hands!